Chambersburg's boys volleyball team will have a reunion of sorts next season, but it will take place on a different floor in a different town. Riley Washington recently committed to St. Francis, a Division I team whose starting middle hitter is Keith Kegerreis, a 2014 Chambersburg graduate. "It should be fun," Washington said. "It's been a couple of years since I played with him, so it should be a good time. I'm hoping to start next year, because they're losing their All-American middle this year, so I'm hoping I can work hard and take his position next year." Washington is one of three Trojans to head to St. Francis in the last four years, and one of four to sign with Division I programs in that time frame. "I'm very proud to go to signing days and have kids in general move on to college," Chambersburg coach Marta Cummings said, "but it's definitely an honor to have them be able to play at a Division I level. It says a lot that all of those guys played volleyball all year round, made it their priority, and it's paying off." Washington is a 6-foot-6 middle blocker for the Trojans and has started for the last two seasons. "He's definitely grown from freshman year to senior year," Cummings said. "Physically, he can do whatever he wants if he puts his mind to it. He's so athletic, and he understands the game of volleyball, but you can't always turn any player into that type of player." Washington had four schools looking at him, and narrowed it down to St. Francis and Lewis University, a Division II program in Illinois. He eventually settled on the Red Flash because of his connections to the team and its close proximity to Chambersburg. But he said the journey to a Division I program has definitely been a four-year journey. "It started with freshman year when I had Mitch Stahl helping me out, and he made me better," Washington said. "After Mitch left, I had Keith there helping me, then I played for Yorktown (club team). As the years progressed, I've gotten better. It's gonna be great to play (at St. Francis); we play all the big teams - Penn State, Ohio State, George Mason - so it should be a good time." Landon Miller and Evan Misal will also play at the collegiate level. Miller is committed to Elmira, while Misal is headed to Arcadia. 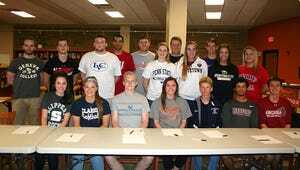 CHAMBERSBURG SENDS OFF 15 MORE: At Chambersburg's recent ceremony for athletes to sign National Letters of Intent, 15 new Trojans were honored. A few, such as Erik Espinoza, of the boys soccer team, and Lindsay Embly, of the girls basketball team, are staying close by, signing intent letters for Shippensburg University, while others, such as Chandler Schur, the goalie for Chambersburg's boys soccer team, is headed far away. He'll take his talents to Hawaii Pacific University. Other Trojans who signed NLIs include Rachael Sollars (Slippery Rock, cross country), Thomas Shearer (Penn State Mont Alto, men's golf); Jordan Shaffer (Penn State Mont Alto, men's golf); Sam Blevins (Albright, football); Jason Reese (Geneva College, football); Nathan Trindel (Lebanon Valley, football); Isabella Weigel (Bridgewater, women's soccer); Lauren Diller (Penn State Altoona, women's volleyball); Cara Long (Kutztown, women's volleyball); Chance McClure (Juniata, baseball); Tara Harmon (Clarion, softball); and Abby Zeger (Kutztown, women's track & field). TWO BALL PLAYERS MOVE ON: Shippensburg and James Buchanan recently announced the college commitments of one of their players. For the Greyhounds, Cole Friese will continue his baseball career at Millersville University, while JB's Nina Shatzer has signed with Mount Aloysius' softball team. 'BORO WELL-REPRESENTED AT NEXT LEVEL: Just two weeks ago, a banner was hung at Waynesboro honoring those student-athletes headed to the next level of competition. Waynesboro's football and girls soccer teams were especially well-represented. Charlie Patterson and Jake Wertz have both signed with Juniata, while Dakota Rhyne is headed to Bloomsburg. For the girls soccer team, Megan Shockey will play at Shenandoah; Monica Beck has signed with Lynchburg; and Katie Clawson will play for McDaniels College. Other recent commits include Nicole Kreimer (Messiah College, softball); Tiffany Stull (Wilson College, softball); Brycelin Spidel (Winston, women's volleyball); Jordan Stoops (Wells College, women's volleyball); Emily Bryan (Penn State Altoona, women's volleyball); Erika Cauffman (Penn State Mont Alto, women's golf); and Katie Shank (Wilson College, field hockey). SLEW OF BLUE STORM SIGN: A number of student-athletes from Mercersburg Academy have recently chosen college destinations. Tori Yoder, of Chambersburg, will play women's basketball at Frostburg State University, and Elliot Hicks, of Mercersburg, will take his talents to the men's tennis team at Emory University. Stephanie Downing (women's swimming), Lizzie Troy (women's swimming), Jake Girard (men's swimming) and Andrew Zhugayevich (men's swimming) are headed for Division I programs. Downning, Troy and Girard will both swim for the U.S. Naval Academy, while Zhugayevich will attend the U.S. Military Academy at West Point. Other recent signees from Mercersburg include Joana Santos (Union College, women's basketball); Luka Sevaljevic (Queen's University, men's basketball); Ben Carter (Denison University, men's swimming); Gabby Fraser (Hobart and William Smith Colleges, women's squash); Saaman Ghodsi (Franklin & Marshall College, men's tennis); Mason Kholi (Muhlenberg College, football), Rina Kyohara (Swarthmore, women's swimming); Courtney Levins (Marist College, women's swimming); Dilin Massand (Occidental College, men's swimming); Will Oakley (Kenyon College, baseball); St. John Smith (Gettysburg College, baseball); and Ruichi Zhou (New York University, men's golf).